Words: O Tannenbaum. First verse is traditional German, and sometimes attributed to August Zarnack, 1820; second and third verses by Ernst Gebhard Anschutz, 1824. Other verses: unknown. Translator unknown. The familiar translation derives from a later version of the German, with ‘wie treu sing . . .’ in verse 1 giving ‘with faithful leaves’. ‘Tannenbaum’ actually means ‘fir tree’. A European favorite, the origins of this song are shrouded in considerable obscurity. Because the words are simple and direct, there has been the belief that "O Tannenbaum" is a medieval in origin. Probably not, although the practice of bringing in evergreens at the winter solstice dates back to the Egyptians. By medieval times, a tradition had arisen: trees and flowers would flower in December to honor the birth of the Emmanuel (if you have a Christmas cactus or if you force an Amaryllis, you're participating in the same tradition). Bringing in evergreens was a continuation of the practices shrouded in antiquity. There is also the legend that the great reformer Martin Luther began the tradition of lighting the Christmas tree; this a is pleasant story, but doubtful. For more information on Christmas greenery, see O Tannenbaum: A Brief History of the Christmas Tree and Other Holiday Plants. The tune was first published in 1799 in Melodien zum Mildheimischen Liederbuch, likely based on a Westphalian folk song and possibly a borrowing from a traditional students' song Lauriger Horatius quam dixisti verum. The tune was there matched to the words ‘Es lebe hock’. The tune also appeared without words in Deutsche Volkslieder in the same year. dat doert de leve Tid. da ich noch grönen kann? If you read German, you'll find more information at: O Dannebom (link opens in a new window at an exterior site). As I have no facility with any language except English (and that is doubted by some), I leave an appropriate translation to my betters. One literal English translations occurs at About.com: O Tannenbaum (link opens in a new window at an external site). The second and third verses were probably written in 1824 by the German poet and Leipzig schoolmaster, Ernst Gebhard Anschutz (1800-1861). The Christmas tree was certainly popular in Germany by this time, although the practice would not become popular in England or America until several decades later. Most likely, the original first verse was first composed in the late 16th or 17th century in Westphalia. Often the subject of indifferent lyrics - both the popular original German or multiple English versions - it is the tune that has carried the song over the centuries. Some of the English translations appear below. Among the best were those by George K. Evans in 1963 in The International Book of Christmas Carols. In both England and America, the song could not have become popular until after the mid-19th century. The popularity of the Christmas tree did not arise until after 1841 in England when Prince Albert erected a tree for his bride, Queen Victoria, and shortly thereafter in the United States. By the mid-19th century, the tune had taken the Atlantic passage; it was the basis for "Maryland, My Maryland" in 1861. Although there are many translations, almost none have any known attribution (perhaps this could be the subject of a treatise by some young doctoral candidate with access to a large collection of mid- and late-1800s carol collections in England and the United States?). There is also a large number of parodies, some of which are not family-safe (and therefore not on this site). No source which I have consulted gives the earliest English translation, either in England or the United States. It does not appear in many of the most popular collections of the 19th Century (e.g., Sylvester, Husk, Bramley and Stainer) or of the early 20th Century (Hutchins, Shaw and Dearmer, The English Carol Book, Dearmer, Shaw and Williams, The Oxford Book of Carols, Routley, The University Carol Book). He also wrote that a song titled "O Christmas Tree" appeared in The Progressive Music Series, Book One (compiled by Horatio W. Parker, and published by the State of Kansas, B. P. Walker, State Printer, Topeka, Kansas, 1914). 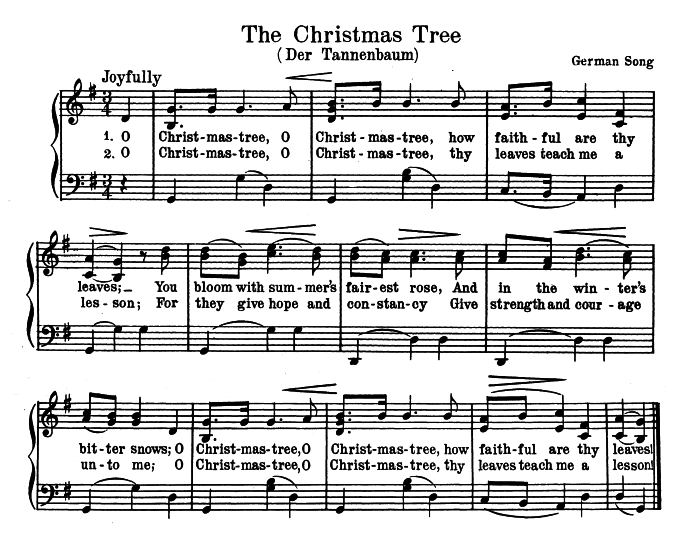 However, although it contains the repeated lyric "O Christmas Tree, O Christmas Tree," it is actually a different song with different lyrics and tune. Subsequently, I discovered a slightly earlier version published in 1908 with the title "The Fir-tree" ("O fir tree tall! O fir tree tall! How faithful are your branches,") It is found in Frederick Zuchtmann, ed., New American Music Reader. Number Two. New York: Macmillan & Co., 1908, #241, p. 115. "O Christmas tree! O Christmas tree! How lovely are thy branches!" &c.
"O Christmas-tree, O Christmas-tree, how faithful are thy branches!" That the lyrics were well known in those times may be inferred from the fact that in both cases, only the opening lines are reproduced. In addition to the many translations beginning "O Christmas Tree" there are numerous others, including "The Christmas Tree," "O Faithful Pine," "O Fir-tree green," "O Christmas Pine," "Oh Tree of Fir," "O fir-tree tall," and doubtless numerous others. The song is widely recorded (possibly because it is out of copyright ... and therefore in the public domain). In my collection of MP3s, I've got over 50 different recordings. Bill Egan favors the versions recorded by Kiri Te Kanawa and the Robert Shaw Chamber Singers. I'm also fond of the Natalie Cole and Nat King Cole versions, plus the simple orchestration of Mr. Jack Daniel's Original Silver Cornet Band. Oscar Peterson also recorded a terrific soft jazz rendition, together with the version recorded by Vince Guaraldi Trio, with its upbeat bridge. A major decorative object in the celebration of Christmas in the Western world is the Christmas tree, an evergreen, often a Douglas fir or a balsam fir, although other species of fir, spruce or pine are favored locally. The symbolic use of evergreens has its roots in ancient times, especially in the Egyptian, Hebrew, and Chinese cultures, in which it signified eternal life. The Egyptians celebrated the winter solstice by bring date palms indoors. The wandering Jewish tribes decorated their booths with tree branches. The Druids decorated trees in honor of their gods Odin and Balder, while the Romans did the same for their Saturnalia. During the Middle Ages, when Christianity became widespread in Europe, the pagan custom of tree worship nevertheless lived on, especially in northern Europe. In Germany, a tree with apples hung on it was called a "Paradise Tree" and was employed as a Garden of Eden symbol in a popular medieval drama about Adam and Eve. Martin Luther eagerly encouraged such practices. There is a tradition that on his way home one night, Luther was struck by the sight of stars shining through the branches of a fir tree; he cut one down, dragged it home, and decorated it with candles in remembrance of the sight ... and thus the practice of the home Christmas Tree was allegedly born. Germans came to set up a paradise tree in their homes around Christmastime and decorated it with wafers (emblematic of the Eucharist), and later cookies, candles, and other forms of decoration. By the 18th century the custom of the Christmas tree was common in Germany, and in fact German settlers had introduced the practice into North America as early as the 17th century. Hessian soldiers also practiced the custom while fighting in America during the Revolutionary War. The tradition was brought to England in the early 19th century and popularized there in mid-century by the Prince Consort Albert, the German husband of Queen Victoria. Due to Victoria's great popularity, it was an instant hit. See: The Victoria and Albert Tree. The tree's use as the decorative focal point of Christmas celebration has not waned. Electric lights, candy canes, shiny ornaments, religious symbols, and other objects are hung on the trees annually, and this decorating activity has spread to the lawns, trees, shrubs, and building exteriors of many suburban homes. The world’s first electrically lighted Christmas tree is installed in December, 1882 in the New York house of Thomas Edison’s associate Edward H. Johnson. And President Coolidge lights the first White House Christmas tree in 1923 to begin a lasting tradition. Cities and towns often exhibit large, spectacularly decorated trees and make a ceremony of the lighting of the tree, as at Rockefeller Center in New York City. O Christmas Pine ("Gifts of love we bring thee"), Translator unknown. O Christmas Tree - Version 1 ("Thy leaves are green forever. "), Translator unknown. O Christmas Tree - Version 2 ("Thou tree most fair and lovely! "), Translator unknown. O Christmas Tree - Version 3 ("O tree of green, unchanging. "), Translator unknown. O Christmas Tree - Version 4 ("How faithful are thy branches. "), Translator unknown. O Christmas Tree - Version 8 ("Your leaves are faithful ever. "), Translator unknown. O Christmas Tree - Version 9 ("With faithful leaves unchanging; different second verse. Translator Unknown. O Christmas Tree - Version 10 ("Thy leaves are so unchanging"), Translator unknown. O Christmas Tree - Version 11 ("How true you stand unchanging. "), Translator unknown. O Christmas Tree - Version 12 ("You stand in verdant beauty! "), Translator unknown. O Christmas Tree - Version 13 ("How lovely are your branches! "), Translator unknown. O Christmas Tree - Version 14 ("How faithful are thy leaves"), Translator unknown. O Christmas Tree - Version 15 ("How beauteous are your branches. "), Translator unknown. O Christmas Tree - Version 16 ("How steadfast are your branches! "), Translator unknown. O Christmas Tree - Version 17 ("Your branches green delight us. "), Translator unknown. O Christmas Tree - The Hemlock Tree, A poem by Henry Wadsworth Longfellow. O Faithful Pine ("You stand in verdant beauty! "), Translator: Alice Mattullath. The Fir-tree ("How faithful are your branches. "), Translator: Aug. Zarnack. To The Fir Tree (O Fir Tree, "Your leaves are constant ever"), Translator unknown. Also found with the title "To A Fir Tree," with the first line beginning "O Fir Tree green!" There are numerous other parodies, some of which are not appropriate for a family-safe site such as this. Nancy J. Skarmeas, ed., The Carols of Christmas (Nashville, TN: Ideals Publications, 1993). There is a very informative page, Tannenbaum History by Ruth Reichmann, posted by Robert Shea on his website. There are a number of links at the bottom of the page that will lead the curious visitor to additional history. As sometimes happens, Mr. Shea changed servers, and this page was lost to me for a few years until a friend of this web site, Bill Croft, located it for us. Thanks, Bill! It's good friends like you that help keep this site great.